Who were the first Crusaders? Pope Urban II launched the First Crusade, which lasted from 1096 to 1099. Jonathan Phillips examines the origins and motives of the first Crusaders. 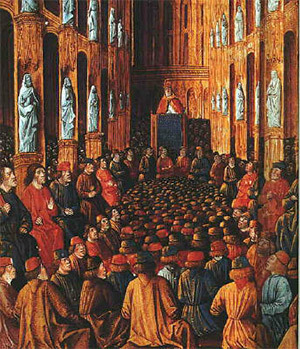 Pope Urban II at the Council of Clermont. Whoever, for devotion alone, not to gain honour or money, goes to Jerusalem to liberate the Church of God can substitute this journey for all penance. In other words, if people fought God's enemies on earth and completed a pilgrimage to the Holy Land, their actions would receive a spiritual reward of remarkable magnitude. Urban blended the familiar ideas of pilgrimage and penance with the more radical notion of papally-sanctioned violence to produce what a contemporary writer described as 'a new means of attaining salvation'. He followed the speech at Clermont with an extensive preaching tour through France and by the dispatch of letters and legations elsewhere in Europe.